The name of Monticchiello first appears in an official document in 973; Marquis Lamberto Aldobrandeschi gave it to the Arniatina Abbey in guarantee of a large loan. In following years Monticchiello became the property of the Roman church, in particular of the Teutonic Order of Knights, a company used to armed combat thus being well suited to the occupation of a border territory; they were in power until 1230. Later the Val d'Orcia was to be involved in various disputes leading to a war between the Siennese and the Florentines. The cause of the war was the claim to ownership of the 'Cassero' (fortified castle keep) of Montepulciano made by both Siena and Florence. Monticchiello itself sided with Siena, which in turn took an active part in castle life and local government. Apartment is fully furnished including Tuscan antiques from the 17th and 18th century. Maribelle is floored with the original terracotta tiles, the apartment has features in Siennese travertine marble, has concealed lighting and is furnished with solid walnut antiques. Apartment has independent gas central heating and newly installed water and electrical systems. To enjoy a real Tuscany antique house, in a very special old village simply to feel good. Maribelle is a lovely apartment in a lovely town. A perfect spot to unplug as there is no wifi or television in the apartment. Barbara is a wonderful hostess. She was responsive to our questions and even escorted us to her friend's winery (Villa S'Anna) where we enjoyed a fabulous tour and tasting. Our only disappointment was the patio. Our selection of this VRBO was driven by a desire to sit on a patio with pastry and coffee in the morning and wine in the evening. Our scrutiny of the photos showed the perfect setting. However, please be advised that the photos are from two separate apartments. Both outdoor areas are shown in the photos, but the downstairs apartment is the one with the patio. The upstairs apartment has an outdoor seating area that is not attached to the unit, is very rustic and has no view. That aside, this is a great place. We found that the kitchen was well equipped. There were more than enough linens. It is a spacious place, with nice views, in an adorable town. If you stay, make reservations at Osteria La Porta in advance as they fill up and it is a great place to eat. Great spot for sunsets, no crowds and easy access to Pienza, Montalcino and Montepulchiano. Again, Barbara is great, you can't do better. We stayed here for three nights and the location is a great place to start from to see a lot of the Hill Top villages and wine tasting. The property lacked only kitchen utensils & the common area is small for anyone with party over 4 people. Barbara, the owner was wonderful and very easy to talk to. We had only one minor issue with Barbara as she thought she was being paid in cash and the account was pre-paid by credit card. You will love this little village and area. 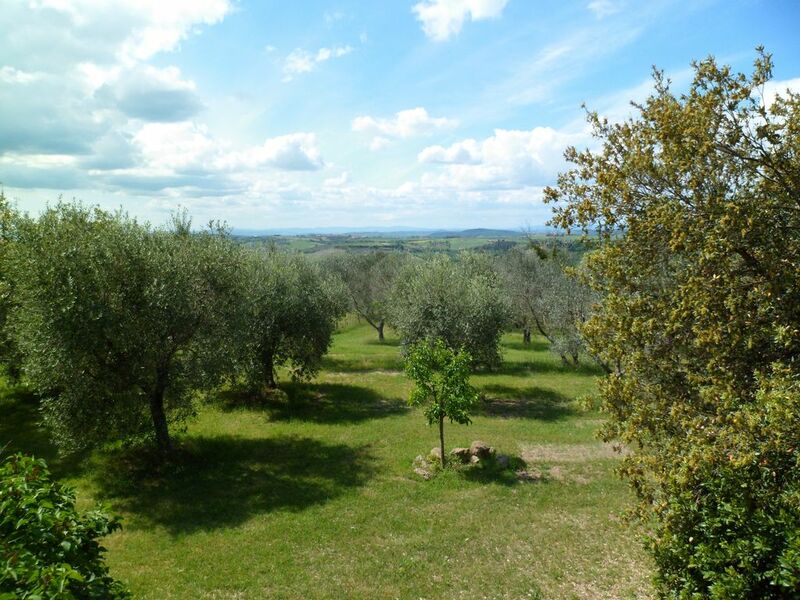 The location of the property in Monticchiello is fantastic. We loved the town, the views, and the people. However the apartment only has AC in the main bedroom (not in the living space or smaller bed room) which made the space uncomfortable and difficult to sleep. The Wi-Fi did not work. The space outside to sit in--was overgrown with plants, and the furniture was broken and dirty and it was not a space you could relax in unless you did some yardwork first. The space has potential but our stay was uncomfortable. I can't say enough about this apartment, town and hostess -- everything was absolutely WONDERFUL, and it was a perfect home base for our Tuscany visit. The quaint town and views from it are breathtaking, in a very peaceful setting. The apartment was even nicer than pictured - large, pretty, clean, and the stillness with just the sounds of birds chirping outside the window was so relaxing. Strolling around the small town was a great way to start each morning, and two locals I encountered were friendly and welcoming, even though we couldn't communicate verbally (a gentleman in the tourist office bought me a cappuccino, and a woman near the church went in the back way to open the front doors for me). Barbara is also a wonderful person. She answered all my questions promptly, was flexible with the timing to meet us, arranged wine tasting, and even drove there and had us follow so we wouldn't get lost. As you can tell, we loved everything about this place, and highly recommend it to anyone without hesitation. Just thinking about it brings a big smile to my face. Don't hesitate to book it and ENJOY! The sweetest gem in the area with a fabulous host! If you are looking for an authentic experience of the Tuscan countryside and the amazing little "villages" that make up all the splendor before you, you will not be disappointed! This is not a place in the heart of tourism and yet such a short distance to all the main towns you will have heard you must visit (Pienza, Sienna, Montepulciano,...)What stands out about this location is the this incredible feel of peace and a sweet intimate community. You have everything you need within a 1 to 6 minute walk (restaurants, cafe, grocery, countryside picnic, breathtaking views, hiking trails, flowers, even the local olive oil producer) and yet you are in the sweetest of small villages in the area. It is as if the town is enwrapped in reverence for it's immense beauty...in fact the very entrance to the town gate is at the precipice of one of the most spectacular views we found in all 6 days of traveling about the countryside...and there are a never-ending collection of beautiful vistas! And the owner, Barbara, is a gem all her own! She clearly loves this beautiful town, the places she lovingly attends to, and the guests she delights in welcoming. We were graced with insightful conversation about the history, enthusiastic conversations of where to go to eat and which wineries she recommends, who and what is happening with the olive oil in the area (and a shout up to the window of the local oil producer!) We stayed in 4 other locations throughout our time in Italy and yet I can enthusiastically say, Barbara is a host that went the extra mile (or three!) to make our stay feel like we were being welcomed home by a good friend! We had such an amazing time in Italy and the hospitality you offered, not only in your lovely flat, but throughout our time in the amazing countryside and welcoming community that surrounds you, created lasting memories for us all, especially my parents who you helped to fulfill a life-long dream! I so appreciated you and your willingness to share your heart with us; we cherish these relationships when we travel as, although the beauty of the land is sweet, the people we meet along the way are what really open our hearts to a new place. Thank you again, my sweet new friend, and know that our door is open to you whenever you wish to visit! Until next time...I can't wait! Four of us spent a delightful week in Montichiello in southern Tuscany at quaint and cozy La Mirabelle, using it as our home base. The apartment has old world charm that derives from its well preserved walled village feudal heritage. We loved exploring the immediate village, getting to know some of the onsite residents and proprietors as well as the more extended communities in Montepulciano, Pienza, Montalcino, Bagno Vignoni and numerous other locales throughout the Val D'Orcia. The wines and the dining were delizioso, particularly at La Porta and La Guardiola right there in the village. Each day ended with the warm return to the charming apartment. Grazie, Barbara, for sharing La Maribelle with us.